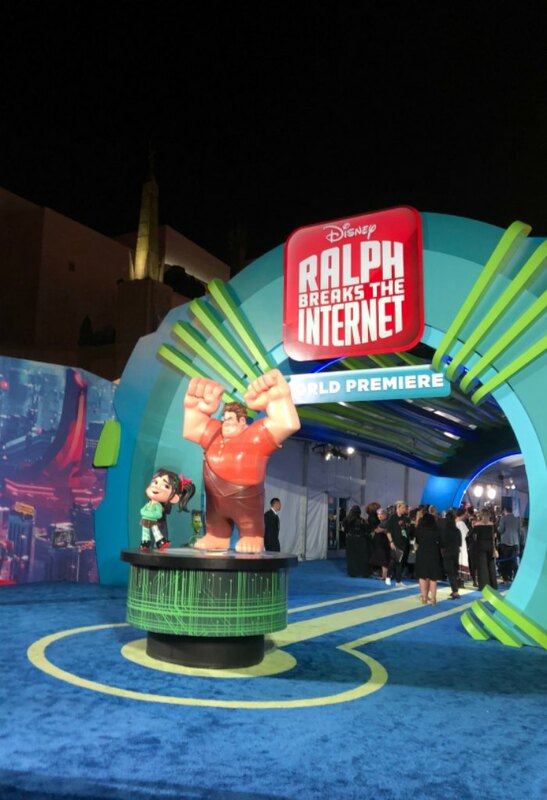 I’m so excited to share all the fun from the World Premiere of Disney’s RALPH BREAKS THE INTERNET in Hollywood! 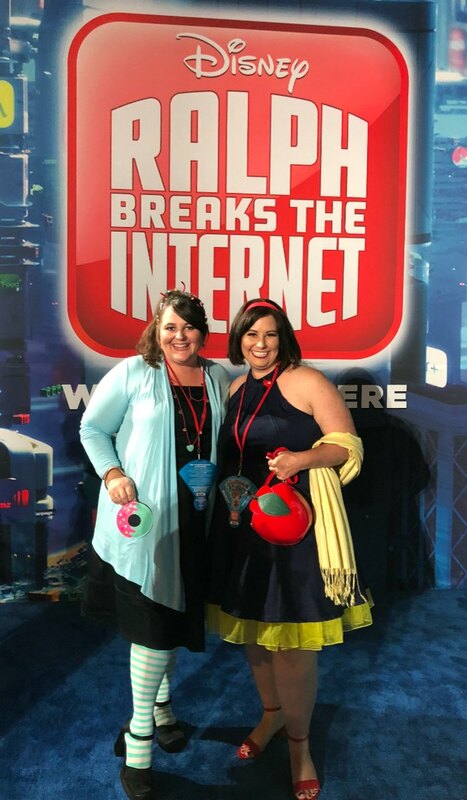 At the invite of Disney, I had the pleasure of walking the red (or in this case, blue) carpet with all kinds of celebrities and seeing the World Premiere of Wreck-it Ralph 2. 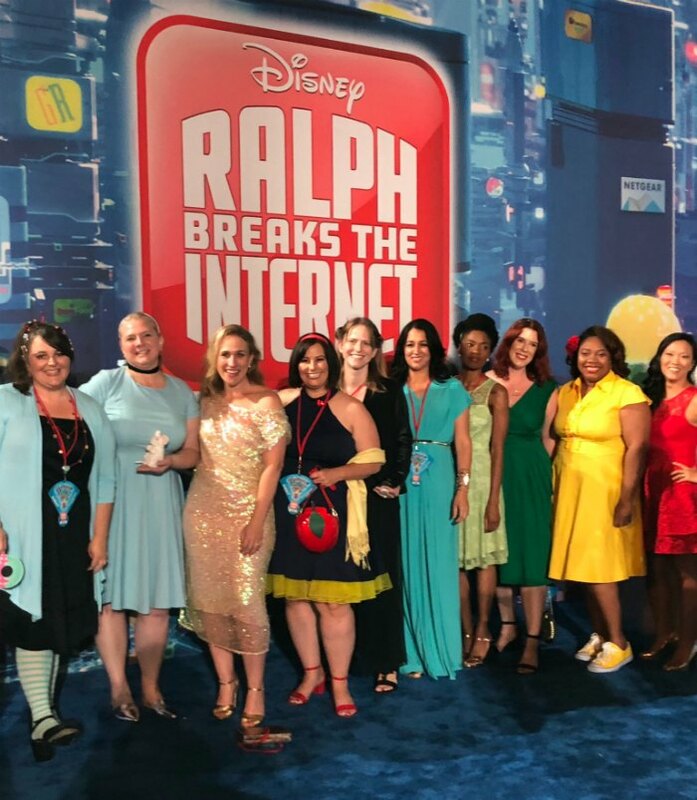 We were in the famed El Capitan theater surrounded by cast, crew, Disney execs & employees, their family & friends, and the other 24 awesome bloggers on our #RalphBreaksTheInternetEvent Press Trip! It was an amazingly fun night!!! 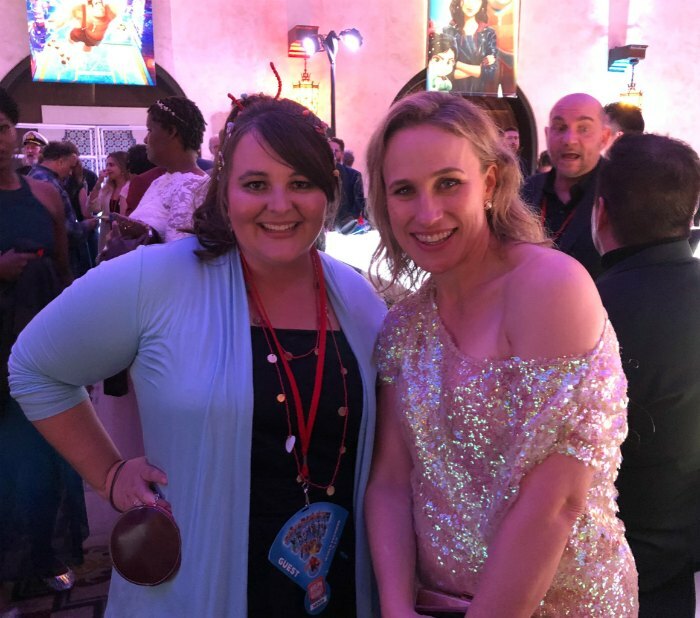 This was actually my 6th red carpet experiences (you can see the others here: Disney’s Planes, Moana, Pirates of the Caribbean: Dead Men Tell No Tales, Thor: Ragnarok, and Avengers: Infinity War) and it’s always a fun, star-studded event! 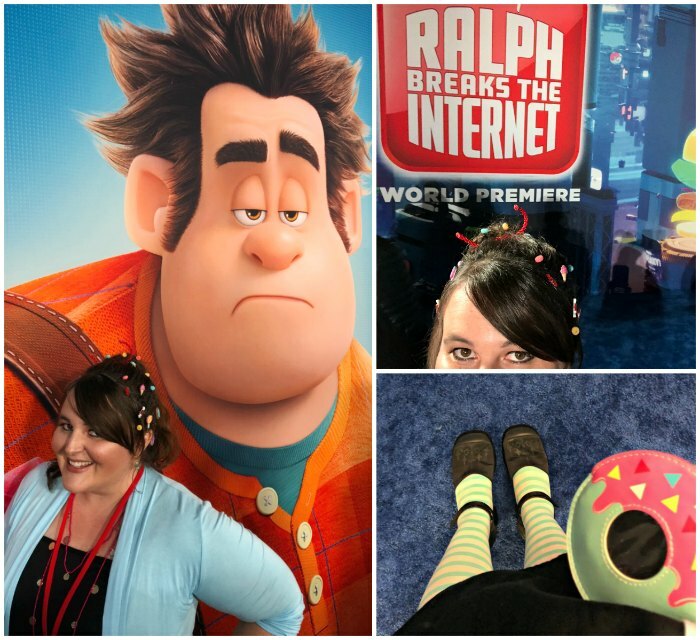 This one had a few fun photos opps – especially in my Vanellope -inspired red carpet look! I had SO much fun putting this outfit together! So about last night…😍❤🎉🍭! 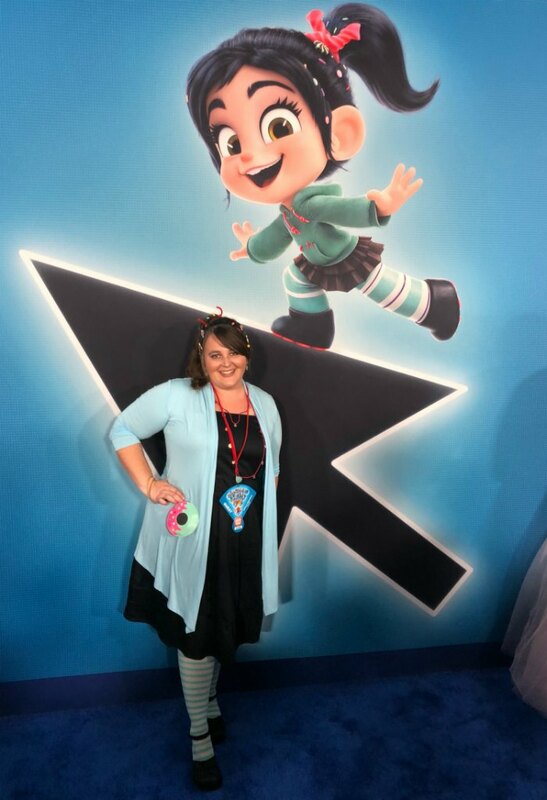 I channeled my inner Vanellope & loved hanging out with Ralph and friends last night at the World Premiere (blue carpet & after party) of #RalphBreaksTheInternet! And about the movie…it’s hilarious (and full of heart). Easter eggs abound through the movie and if you’re into “meta” Disney moments, you will LOVE multiple parts of the movie! 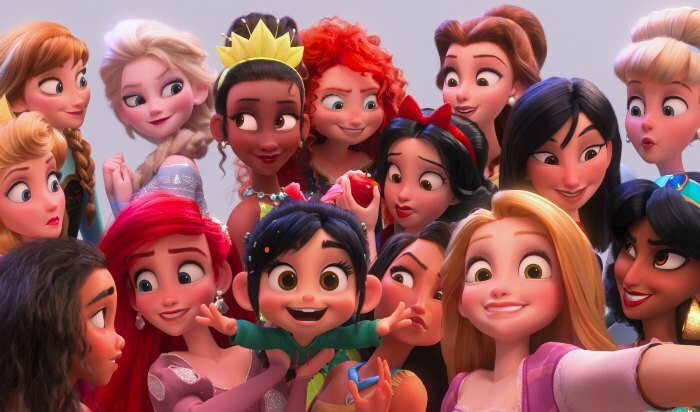 The Disney princesses are EVERYTHING! Plan to take the whole family on Nov. 21st and stay through the credits! I was nervous about it at first, but super happy with the way it turned out! 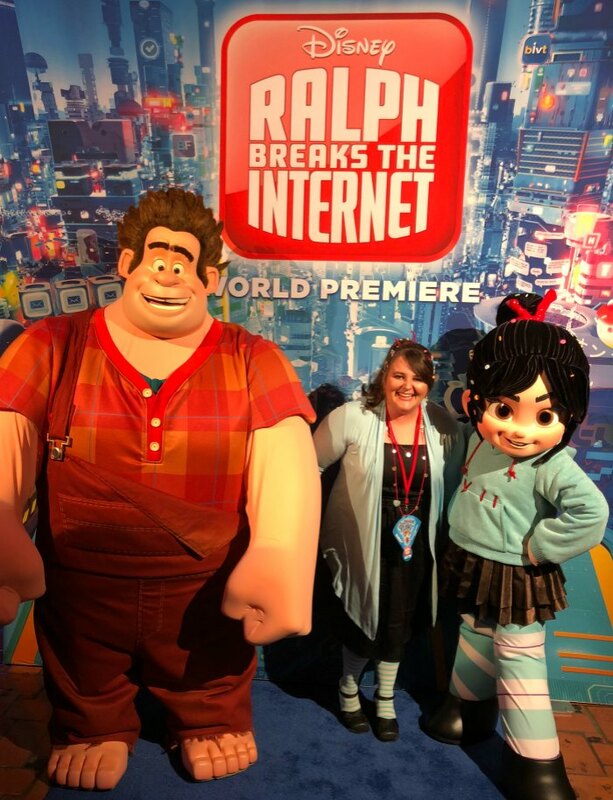 It was so fun taking photos “with” Ralph & Vanellope on the red carpet! Though Ralph wasn’t particularly thrilled with selfies ;), I had to get a few photos of all the special outfit details! The hair accessories deserve their own how-to post (so more on that later). But the candy in the hair, the fun striped tights, and the donut bag really made the look!! The REAL Ralph & Vanellope actors were on the carpet as well of course. 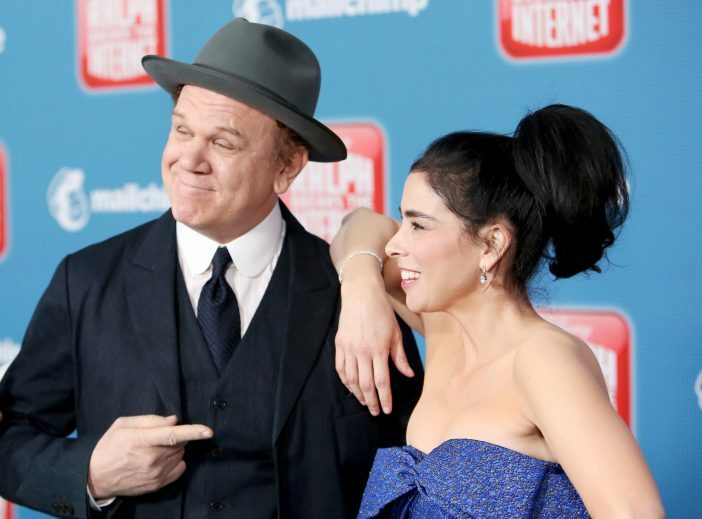 John C. Reilly and Sarah Silverman are both awesome voicing these characters! And many of the Disney Princesses were on the carpet as well! They are SO fun in the movie! I saw many of these lovely ladies firsthand on the carpet and/or the after party! 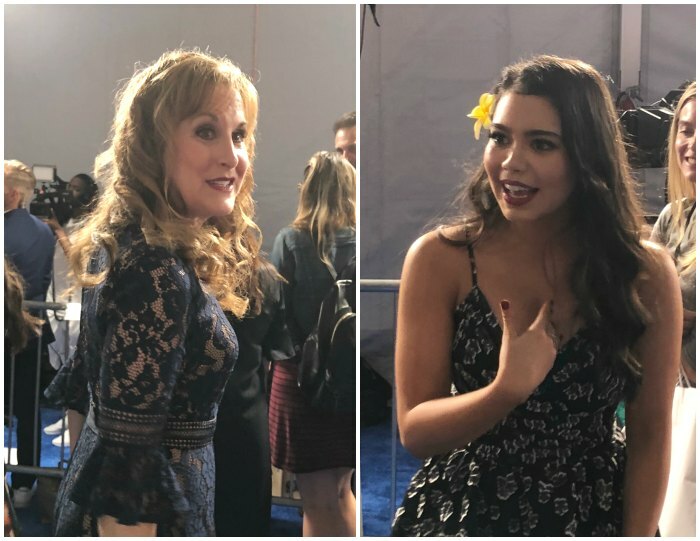 Two favorites, Jodi Benson (voice of Ariel) and Auli’i Cravalho (voice of Moana), were right near us a few different times – so fun! I’ve actually had the pleasure of interviewing both of these famous Disney princesses as well. 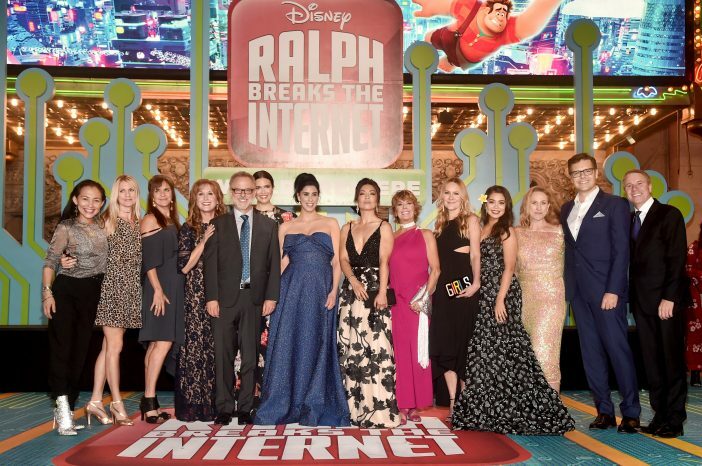 Check out those here: Jodi Benson Interview and Auli’i Cravalho Interview. Without telling you too much, I’m telling you the Disney princesses in the movie are EPIC! Full “meta” Disney and laugh out loud funny! The brilliant mind behind this idea is Pamela Ribon, co-writer of the film (and voice of Snow White in the movie as well). We got to talk to her earlier in the day and then saw her on the carpet. She was gracious enough to take a photo with some of us! You can see that in addition to my Vanellope inspired look, there are a lot of Disney princess inspired looks on the carpet. Can you spot Cinderella, Snow White, Jasmine, Tiana, Belle, and Mulan? My friend Patty (from My No-Guilt Life) were rocking our Disney character looks don’t you think?! I ran into Pamela again at the after party where she stopped me to comment on how much she loved my hair and outfit! AHHHhhhhhh! When the writer of the film thinks you’ve done a good job with your character-inspired look?!?! SO cool – that made my night! So, I had to get a photo with her! She’s hilarious, gracious, and SO good at what she does! 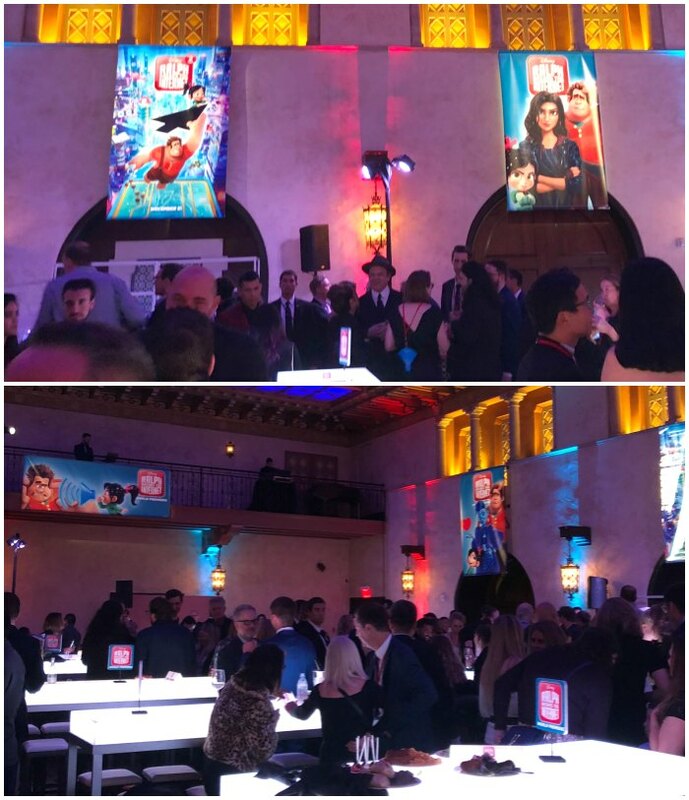 After the movie (which was FABULOUS – more on that later), we all got to attend the super fun after party at The Roosevelt! It was a star-studded family affair with great food, fun photo opps, and more! It’s such a surreal experience being in the same room with SO many famous people! If you look closely you’ll spot a few in these pics! 😉 I don’t like to bother them while they’re hanging with family & friends. But, you know I HAD to get a photo with the two stars of the night…Ralph & Vanellope! 😉 SO fun! 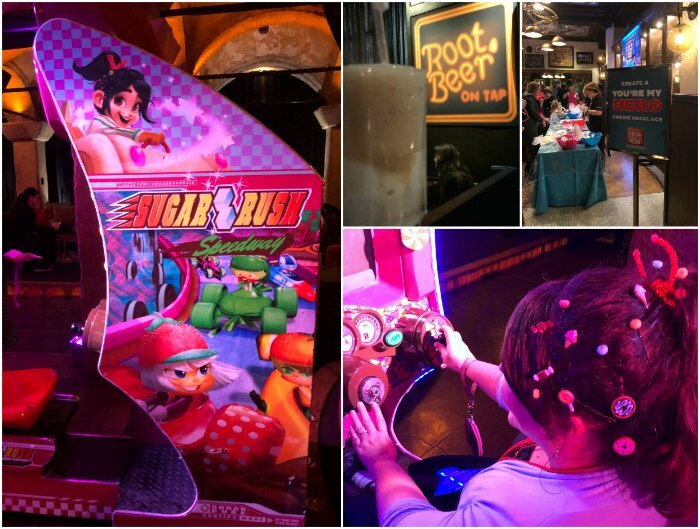 In addition to celebrity-spotting and some yummy food, we enjoyed root beer floats at Tapper’s Bar (just like the game in the movie), a “HERO” cookie decorating station, and a REAL Sugar Rush game! SO fun!! Such an awesomely fun night and a super fun movie! Buy your tickets NOW and make plans to go with the whole family when it hits theaters in a couple weeks! Video-game bad guy Ralph (voice of John C. Reilly) and best friend Vanellope (voice of Sarah Silverman) leave the comforts of Litwak’s arcade in an attempt to save her game. 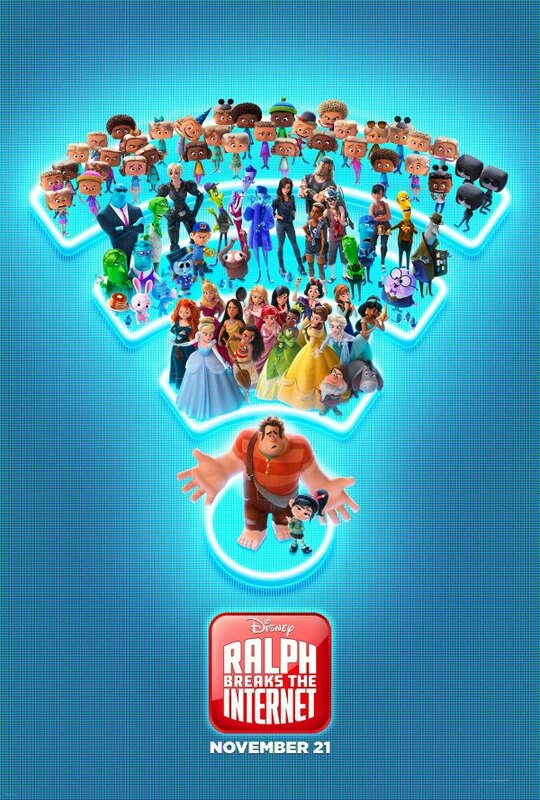 Their quest takes them to the vast world of the internet, a world Vanellope wholeheartedly embraces—so much so that Ralph worries he may lose the only friend he’s ever had.” Ralph Breaks the Internet officially opens in theaters November 21. Disclosure: Disney hosted me in LA in order to attend screenings and to participate in group interviews & media events. As always, all opinions, experiences, and love of Disney are entirely my own!